Digital Art Masters: Volume 6 delves into the working practices of some of the world’s best digital artists to reveal the creation processes behind their breathtaking images. Originally launched in 2005, the annual Digital Art Masters series continues to showcase the work of some of the finest 2D and 3D artists from around the world. 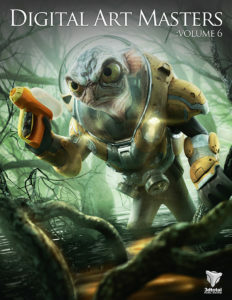 The latest volume, Digital Art Masters: Volume 6, welcomes another 50 up-and-coming and veteran artists, and follows the tradition of taking readers beyond the breathtaking images with detailed breakdowns of the techniques and tricks each artist employed while creating their stunning imagery. Inspirational and instructive, this is more than just a gallery or coffee table book. Digital Art Masters: Volume 6 is a valuable learning tool with the added bonus of video tutorials from selected artists who specifically detail an aspect of their gallery image from start to finish, offering further technical insight into the creative process.